With work of exceptional Quality Since 1974, we are a family owned company, At one time a Father and Son partnership, it is now an everblooming superior landscape service business. We strive for perfection in our work, and for this reason we are well known. Our customers are very important to us which shows in the quality of our work. Please call us today at 952-461-2579 for more information about us and for a free estimate! 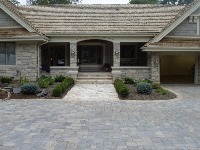 With our 42 years of experience we have been left with many happy customers and tons of showcase homes!